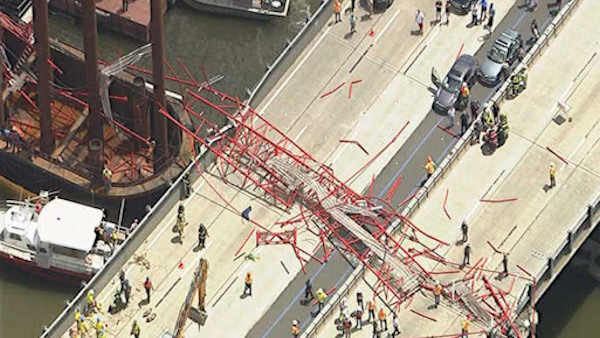 TARRYTOWN, New York (WABC) -- Drivers should expect delays on the southbound Tappan Zee Bridge, as crews make repairs following this week's crane collapse. Traffic on the southbound Tappan Zee at exit 11 was reduced to one lane beginning at 8 p.m. Thursday night. The work is scheduled to be finished by 5 a.m., in time for the morning commute. Delays are expected on southbound I-87 and eastbound I-287. Drivers are advised to seek alternate routes if possible. The crane blocked six lanes of traffic when it collapsed on Tuesday, but no one was seriously hurt. Three northbound lanes will remain open to traffic during the work. Following the completion of the overnight repair work, traffic will resume on three northbound and three southbound lanes of the bridge in time for the Friday morning commute, the New York State Thruway Authority said. Phase two of the work to repair the far right lane will be announced in the coming days.